Tom Stanley’s paintings in Scratching the Surface, his solo exhibition at the Halsey Institute, carefully balance easily recognizable forms such as houses and boats with subtle references to art history by utilizing painting techniques that range from sgraffito of the ancient Greeks to drip painting methods found in abstract expressionism. By doing so, he creates contemporary art that is perfectly suited for the revitalized dialogic museum—a space defined by education through conversation and connections. Answers are neither right or wrong, but instead, visitors are encouraged to engage with the space and the art. The dialogic museum is characterized by its mission to connect with visitors and inevitably to connect visitors to the art. In addition to careful curation and research of contemporary art, it focuses on educational programming for children and adults alike, hosting events such as artist talks, gallery walkthroughs, and more tactile events for the younger visitors. For example, during Scratching the Surface, the Halsey Institute hosted an event at the Charleston Farmers Market to teach kids how to utilize sgraffito—a technique Stanley uses frequently in his oeuvre where he scratches the top layer of paint to reveal another layer. Doing so provided a tangible way for participants to connect to Stanley’s painting techniques that harken back to the Italian Renaissance, and before that classic Greek pottery. 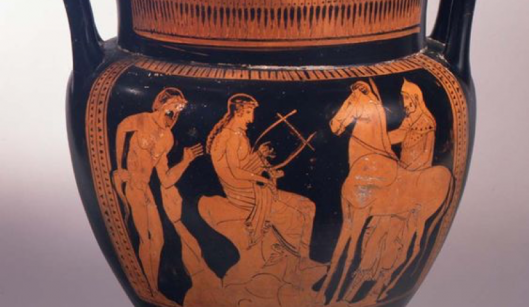 Orpheus among Thracians. 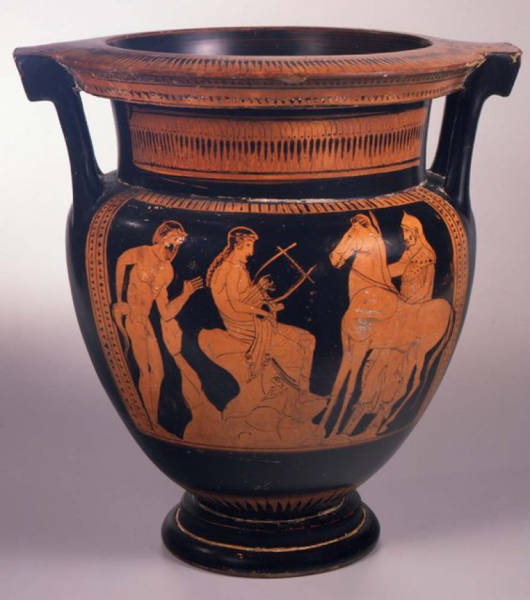 Greek, 450-420 B.C. In some regards the dialogic museum is the “reinvented museum” and is in opposition to the traditional museum, which perpetuates the disconnect between the art and the museum’s visitors. A certain expectation remains for those who enter a traditional museum. They should be quiet, they should be educated, and for the most part, they view the art on display in an objective manner. It is important to note here that neither form of museum is “incorrect,” there is simply a dichotomy that is worth noting when exploring the function of an exhibition space. On the opposite end of the spectrum, there are visitors that enter with prior knowledge of art history, and may have preconceived expectations of how a certain exhibition will explore the craft, or even how it might be referential to other aspects of art history. On surface level, they will be met with the same initial reaction as the younger visitors might be—perhaps a whimsical interpretation of a neighborhood. Upon further investigation, they will find a number of references to different time periods in painting across art history, as Stanley includes sgraffito (prevalent in classical Greek pottery and later in frescoes of the Italian Renaissance), Abstract Expressionist drip painting (Jackson Pollock, Janet Sobel), and line work that is reminiscent of the European surrealists (Rene Magritte, Max Ernst). 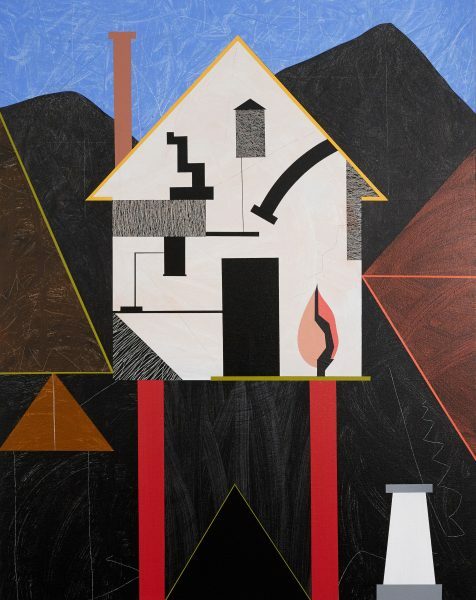 Beyond that, certain shapes in his work are made by tracing around tools that could be found in a painter’s studio, leaving silhouettes that may only be recognizable to fellow visual artists. All the while, he maintains his own visual language, abundantly interesting, and always reflective of his life experiences. 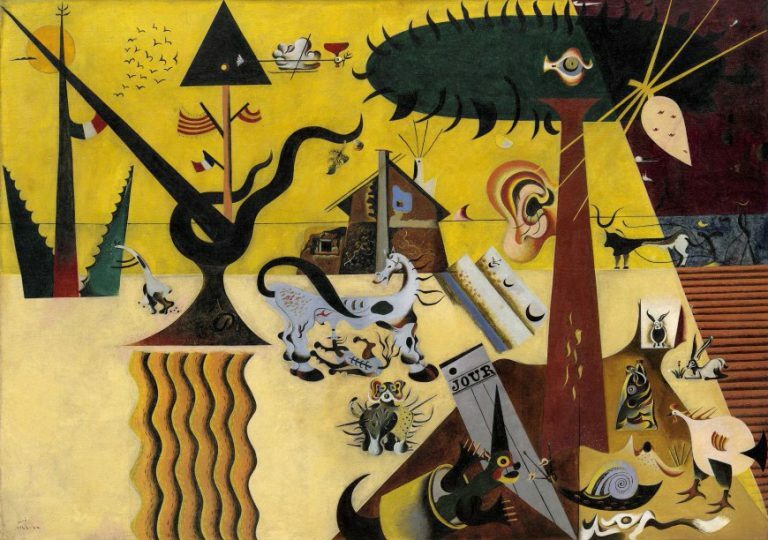 Joan Miró. The Tilled Field, 1923-24. As museums change and update how they function, the visitor’s relationship and experience with the art will be affected as well. The reinvented museum encourages visitors to engage with art visually and dialogically. Tom Stanley’s work is a prototypical example of how visual art can support these changes in the function of museums. His synthesis between accessible forms and vast knowledge of both his craft and art history in general provides a captivating exhibition that makes it easy for Halsey visitors to begin artistic conversations and to make valuable connections that heighten the museum experience.